Day +330: Things are still rolling along here. Today we got insurance approval for the 2nd BMT and I chatted with Kiira’s Hematologist, who has a background in bone marrow transplants. She wanted to make sure we knew a BMT isn’t a cure, but it could improve quality of life and that if we choose to do it, the sooner the better. Younger, smaller patients tolerate the chemo better and if she has good nutrient counts, no infections or anemic tendencies, less complications should arise. Our labs this week showed we are in a good place, so we’ll just keep things going as they are. The next step is to figure out the donor, but we are still on track for a late July BMT. Kiira’s skin has had a bit of reprieve this week. 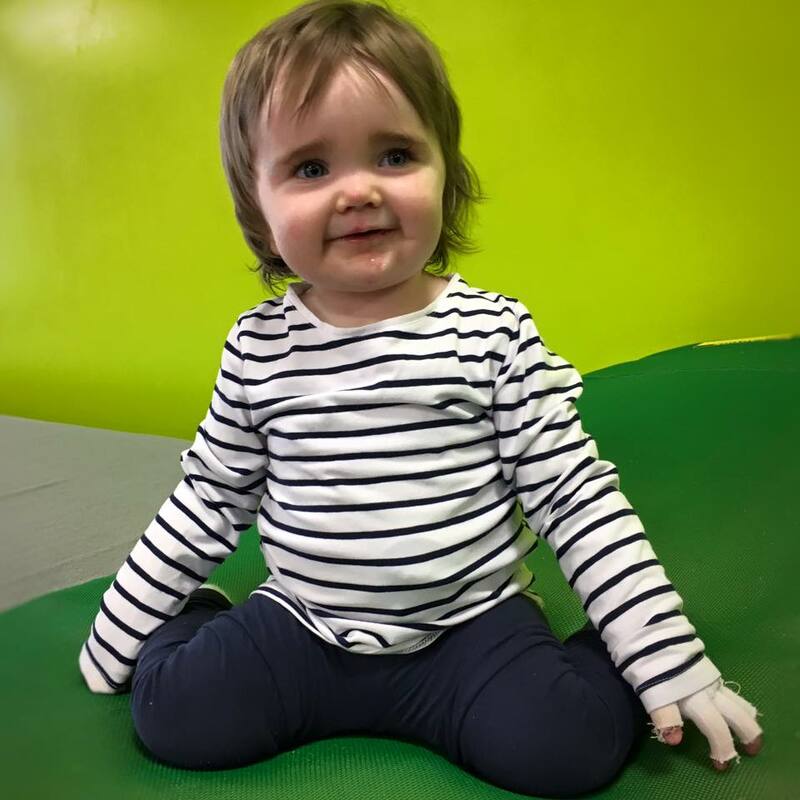 Her rash is gone and we found a solution to the severe cradle cap that made her head itchy and red, and her knees and feet are on the mend. Now she scratches when bandages are off, so it’s a race to get them back on before she tears the skin off as she did to both wrists over the last could of days. 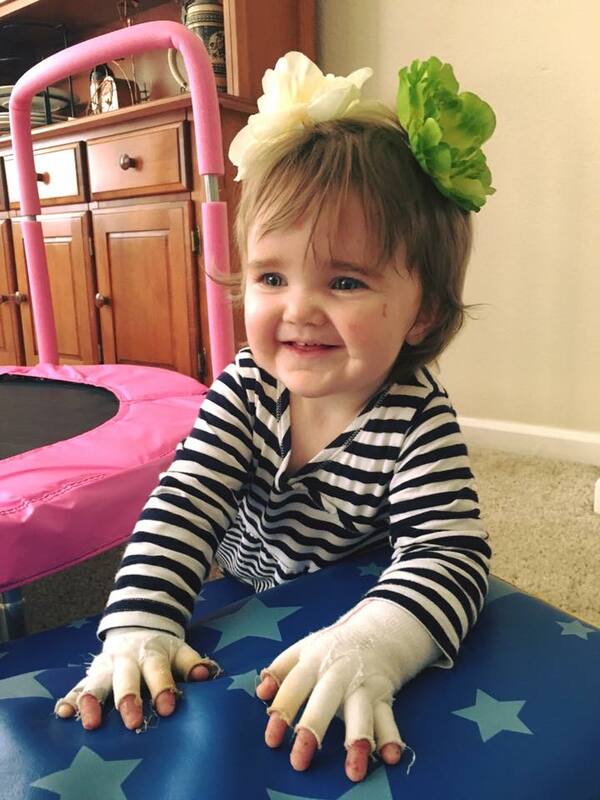 Despite the skin issues, Kiira loves to dance and play and laugh. She says, “Hands? Hands?” to her sister so they can dance together. I cherish these moments! Day +322: One year ago we began our journey to Minnesota. We left our home, family and friends and moved our whole family halfway across the nation to seek treatment for Kiira. And we will likely be doing it again all too soon. This time we’ll drive out together but after Kiira’s BMT, Jason and the girls will head home while Kiira and I wait out the 100+ days that she is required to stay. I hope my girls don’t forget each other, or me. I hope as parents we can figure out the single parenting thing. I hope to be home in time for Christmas, and that Kiira will be joining me. I’ve been watching other BMTs take place. I see the struggles, the joys, those who are doing well because of it, and those no longer with us. I don’t know if this is the “right” answer for Kiira, but after a lot of prayer and thought and setting aside my own selfish reasons for not wanting to go, we feel it’s the best. Her skin is breaking down like crazy, 2 toes are just starting to web despite every effort to keep it from happening, and I just feel like we are losing this battle against EB, but a BMT might help us start winning again. Whatever path this leads us down, we have to trust that God’s plan will prevail and whatever comes, He will guide us through. Day +317: Kiira is now 19 months old. She is talking so much, climbing up on couches and chairs, tries to jump, and feeds herself quite well. She has lost some weight, so we increased her calories but she is so active now that it’s no wonder. 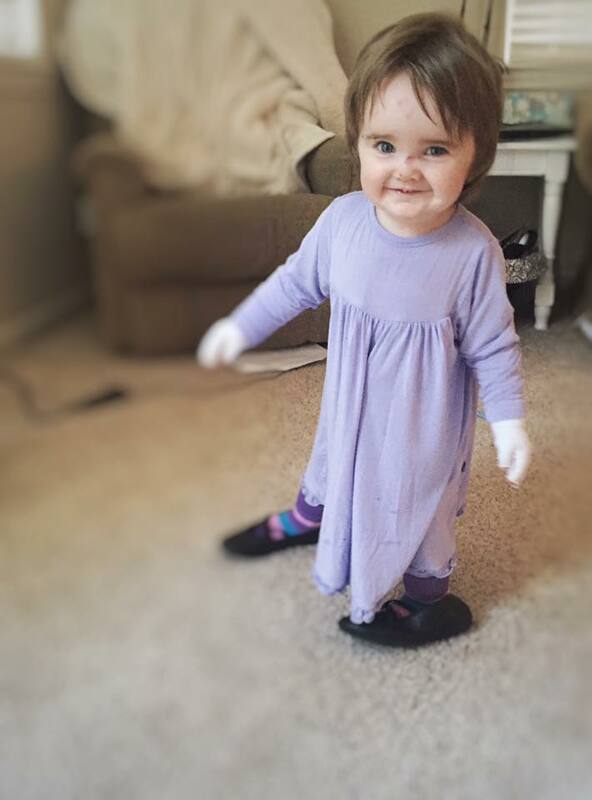 She thinks if she wears shoes, we will let her go outside. If only it was that easy… She will put on her sisters shoes but we still need to find shoes that will work over Kiira’s bandages. 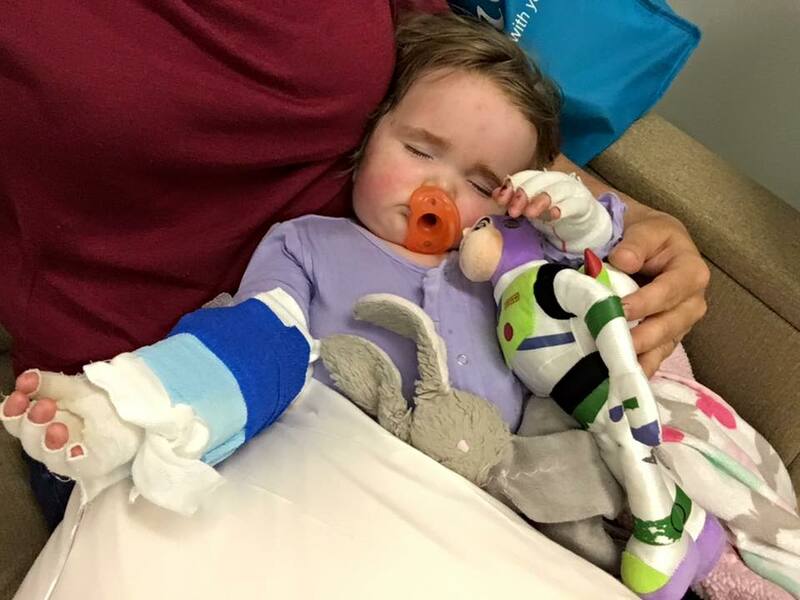 So the call with Dr. Tolar… He answered all of our questions and to summarize: a 2nd BMT isn’t really any riskier than a first, there have been a couple successful 2nd BMT patients with EB, the cure we seek is too far off, and he would recommend a 2nd BMT. We have a lot of decisions to make, but if we proceed with a BMT, we could possibly get it done as soon as late July. Kiira is still healthy–not sickly, no infections, no signs of internal damage. Getting a BMT before these issues arise is important to us. Of course getting one still carries risks and so much sacrifice. We have to weigh all of these things into our decision, but our options are to do it and pray the benefits outweigh the risk, or don’t do it, and let EB progress as it does with RDEB. Please pray for us as we figure out the best path for Kiira. We love our girl so much and we want what’s best for her. Day +313: Today I have the special privilege of holding Kiira while she sleeps during her IVIG infusion. A few pokes and a lot of screaming wore her out, but I can hardly remember a time that I got to hold her as she slept. As a baby, she was always on a pillow. My heart is heavy with the loss of Raul and so many others who don’t get to hold their babies again and today, I don’t take one second of this for granted. Day +307: This week has been full of our usual activities–gymnastics, occupational therapy, bandages, etc. Her knee and hand are healing, and her foot reblistered yesterday, but Kiira is still walking, crawling and climbing as usual. 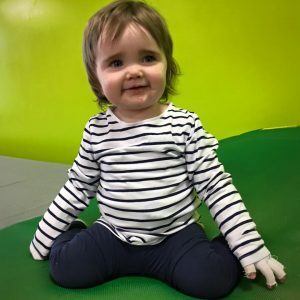 On Monday I took her to gymnastics to play by herself and stayed for a few minutes to join the toddler class with playing with a parachute. I’ve had kids to our house who play alongside Kiira, but Kiira has never played in a big group before. I wish I could have enjoyed it because she was in awe, but I was overcome with fear–what if they fall on her or step on her hand or knock her down? The anxiety was overwhelming and surprising to even me. I want her to be a kid, but I’m just not ready for her to play interactively like that. Tomorrow we have our call with Dr. Tolar to discuss the second bone marrow transplant. We have a long list of questions ready and definitely not ready to make a decision about it until after that conversation. However, our plan, if we move forward with it, is for me to take Kiira to Mn for the minimum of 114 days and Jason will stay in Ca with the girls. It would be a very different situation from last time, and of course that plays into the decision. Regardless of sacrifices we both need to make, we want what is best for Kiira. Please pray that we find clarity after our call tomorrow to either move forward with another BMT or not, and that we can feel peace about the decision. Thank you!